The Tingari relates to the journey's of the ancestors, men and women who were there at the beginning of creation, travelling across the land creating the hills, the mountains, plants, animals and humans. Tingari is a sacred "Men's Business" ceremony. When the young boys reach about eleven or twelve they to have leave their mothers and go with the senior men into the country to learn about the land and the life that it protects. Once the young boys have passed their tests they are then initiated and take on the knowledge and the responsibility that goes with it. Tingari has been a part of Pintupi law since conception, and the paintings of Tingari have been created since the early days of the Aboriginal art movement and are a part of Aboriginal history. Originally drawn on the body for ceremony, now on canvas to educate those willing to learn. Elements such as linked concentric circles and squares have become the icons of the Tingari depicition. Whilst a lot of the Tingari paintings are in the traditional earth colours, artists such as Ronnie Tjampitjinpa have created their Tingari paintings using big bold shapes with vivid colours such as oranges, blues, greens and purples. The circles and squares have become quite irregular in many of the Tingari paintings of today as artists add other dotted and filled-in areas. Regular shapes have been distorted, pulled in various directions on the canvas as the artists work on their painting, creating a brilliant piece of artwork while still maintaining the integrity of the sacred Tingari ceremony and protecting parts of the story that are restricted to all but the initiated. Traditionally Aboriginal people used natural earth pigments to paint on their bodies and in the caves. Drawings were also done in the sand. Things like feathers and pieces of fur, wood, leaves were stuck on the body with tree resins and plant glues. Blood from animals such as kangaroos was used to paint, and in the Kimberley area is still used today. At the beginning of the painting movement the artists at Papunya were supplied with water colours and acrylic paints, but other areas of the desert the Aboriginal artists still used the traditional earth pigments, at first they were reluctant to change and to reproduce sacred ancestral designs to be viewed by the public. Because of the dramatic changes in Aboriginal lifestyle due to European occupation, there was concern amongst many of the seniors that a lot of important Aboriginal culture and spirituality would be lost if there wasn't a permanent record. After much debate by these Aboriginal elders it was decided that some aspects of their sacred stories could be told on canvas as it would be a permanent statement of their culture. In 1985 the co operative, Warlukurlangu Artists Association was formed to implement this policy so that paintings could be viewed in the public domain. Australian glass artist dances with fire to create some of the finest glass pieces to hit the international art world. Tina Cooper, one of Australia's finest glass artists with a reputation internationally, is a resident on Queensland's Sunshine Coast, where she works with liquid currents of molten glass drawn from a 1200 degree furnace to create her masterpieces. "I am a rough diamond that does not want to be polished because my rawness has taken a lifetime to create, just like a diamond" Tina says. United States President, Barack Obama, purchased a piece of Tina Cooper's indigenous series for the White House. The outback pieces that Tina has created are simply amazing, crafted in glass drawing inspiration from her trips outback to the desert and beyond. Tina hopes that people sense and share the depth of love and feeling that she puts into all her work which is a true expression of her own emotions and thoughts of the moment. Her strong connection with the Australian environment is reflected in many of the pieces that show illusions of the Sunshine Coast beaches and her love of the ocean. All these are richly represented in her glass art, making her one of the most sought-after glass artists in the world. Balgo Hills is one of the most isolated Aboriginal settlements 300km from the nearest town of Halls Creek. During the wet season this community can be cut off for many months and during the dry times its a hot arid region of the desert. The colours of the landscape in this area reflect the impact that they've had on the desert artists; the intense colour of the hot orange-red sand contrasts with the deep blue of the sky, the soft green of the spinifex covered sand-dunes harmonizes with the deep purple hues as the sun sets. Balgo was originally established as a Catholic mission in 1939 and became an "Aboriginal controlled" community in 1981. Different from other Aboriginal communities such as Papunya, the children were not separated from their parents and their own language was not forbidden. In 1981 an Adult Education Centre was established and 2 years later a bilingual Catholic school was created, because of these schools the painting community was able to start in ernest.. Many of the elders who came out of the desert to live at Balgo became part of this emerging painting community. Art from Balgo has it's own unique style. 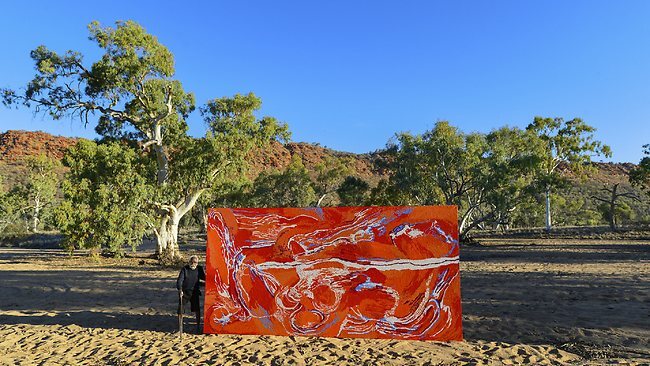 Known for its strong vivid colours, extremely wild and flamboyant design, the Aboriginal artists of the Balgo region have had a profound effect on the centre and western desert art movement.